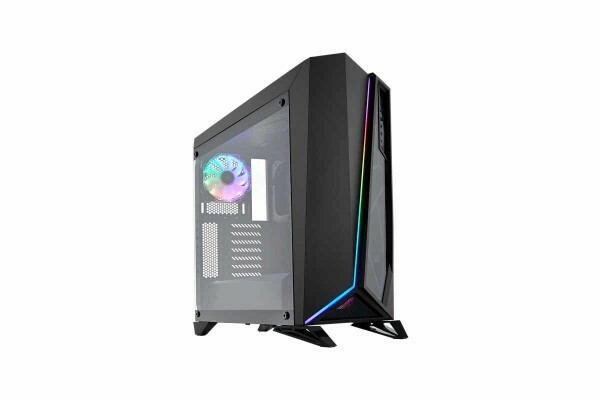 The Carbide Series SPEC-OMEGA RGB is a mid-tower PC case with a striking look and tempered glass side panel. The tempered glass viewing windows embedded in the front and programmable RGB lighting profiles make this SPEC very special. The asymmetrical, edgy design and an integrated RGB light strip give the SPEC-OMEGA RGB a modern and individual look. With the built-in Lighting Node PRO digital RGB lighting controller, iCUE lets you easily select new lighting modes or create your own effects from a variety of preset effects. Accommodates up to six 120mm fans or a Hydro Series 360mm radiator on the front, a 240mm radiator on the top, and a 120mm radiator on the back. The side panel and tempered glass front make your system a real eye-catcher, and cables and drives disappear behind an integral power supply cover to make your system look as neat on the inside as it does on the outside. 30 RGB LEDs on the front and two integrated CORSAIR HD120 RGB fans allow a comprehensive RGB adjustment. Cool your system with a Direct Airflow Path ™ layout for an unobstructed airflow, so that the cool air quickly and efficiently reaches the overheated components. Powerful CORSAIR iCUE software brings your system to life with dynamic RGB lighting control that syncs with all your iCUE-compatible products, including fans, RGB LED strips, DDR4 memory, keyboards, mice, and more.